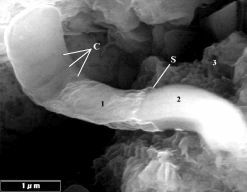 On March 4, 2011 in the Journal of Cosmology, Richard B. Hoover (a scientist working at NASA's Marshall Spaceflight Center) published his third controversial paper on new findings of potential fossilized bacteria, many similar to familiar and unknown Cyanobacteria and other trichomic prokaryotes such as filamentous sulfur bacteria that are missing amino acids found in similar, modern Earth bacteria, on freshly fractured inner surfaces of extremely rare but water-rich, carbonaceous meteorites ("CI1 carbonaceous chondrites") recovered from France, Antarctica, and Tanzania. Although the microstructures showed evidence of carbon, a potential marker for Earth-type life, there was almost no nitrogen, which could have decomposed into gas long ago. If the structures are confirmed as bacterial fossils, however, at least one commenting scientist (i.e., Patrick Godon) has argued that it is unclear whether ancient meteoric impacts on Earth may have contaminated some of the carbonaceous debris in space with bacteria that originally lived on Earth, as well as presumably Mars, Venus, or other planets, moons, or smaller asteroidal or cometary bodies. Regarding Hoover's decade-long investigation, another commenter and sometimes collaborator (Elena V. Pikuta) noted that hundreds of scientists (including experts in many fields) assisted or were consulted, that the Carbon-13 and Deuterium to Hydrogen content of amino acids and other organics in the meteorities examined are consistent with known cometary composition, and that some microstructures come from the Orgueil meteorite, which contain magnetites that have been dated to be 4.56 billion years old and so may be older than known life on Earth (Ferris Jabr, New Scientist, March 8, 2011, with more counter arguments; NASA amended statement of disavowal from SpaceRef; redOrbit staff and Reuters wire report by Deborah Zabarenko, redOrbit, March 7, 2011; Alan Boyle, MSNBC, March 6, 2011, and March 7, 2011; Richard B. Hoover, 2011 with more images, and commentaries; 2004; and 1997). meteorites found on Earth (more). What is life and did it develop elsewhere? 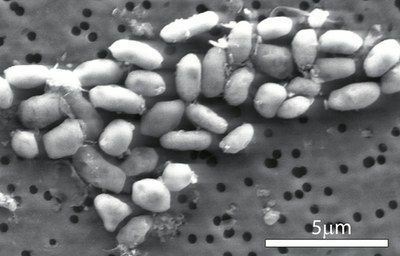 Under these types of definitions, viruses (and prions) which rely on larger lifeforms to perform metabolism and reproduction are not technically alive, but the status of possible nanobacteria (under 200 nanometers) has yet to be resolved (Caroline Williams, New Scientist, November 19, 2010). photosynthetic microbes that also produce oxygen. (also Horneck et al, 2008). It is possible that life on Earth has developed independently more than once, and that some lifeforms rely on biochemical processes different from those already known. It is also possible that these "exotic" lifeforms persist on Earth today. If so, they may be difficult to detect (Paul Davies, December 2007). Many biologists believe that all Earth lifeforms that have been studied in detail thus far almost certainly descended from a common origin. Apparently, organisms found thus far on Earth share a similar biochemistry and rely on a highly similar genetic code (relying on DNA, which possibly developed from RNA and even earlier precursors) which enables biologists to sequence their genes and position on a single tree of life. Some (including Paul Davies), however, argue that the procedures used to analyze newly discovered organisms are too customized to detected life as already known to biologists and so lifeforms relying on alternative biochemical processes may commonly exist but escape detection. Mirror life - In known lifeforms, large biologically important molecules have a strict orientation, where amino acids are left handed and DNA is a right-handed, double helix. Exotic amino acids - With rare exceptions, all familiar organisms found on Earth use the same 20 amino acides to build proteins, but chemists have synthesized many others (e.g., isovaline and pseudoleucine which also have been found in meteorites). H2O2 life - Hydrogen peroxide and water in intracellular fluid may help microbes survive in very cold and dry conditions, and some biologists speculate that NASA's Viking probes may have detected such life on Mars in the 1970s (see Life on Mars?). Arsenic life - Although poisonous to life that relies on phosphorus, arsenic can fill the biochemical role that phosphorus plays in known lifeforms because it mimics phosphorus so well. A team of scientists at the U.S. Geological Survey now believes that photosynthesis based on arsenate (using arsenic with four oxygen atoms attached as an energy source) evolved in Earth's arsenic-eating bacteria at the same time or even before "normal" photosynthesis, and that a similar mechanism may once have fuelled life on other planets -- i.e., Mars, Jupiter's moon Europa, etc. (more discussion from NASA Science News; Olivier Dessibourg, New Scientist, December 2, 2010; Wolfe-Simon et al, 2010; Nora Schultz, New Scientist, August 14, 2008; Tina Hesman Saey, Science News, August 14, 2008; and Oremland et al, 2008). Chlorinic life - Although poisonous to life that relies on oxygen (which is also highly reactive), chlorine could be produced as a waste product by alternative but more vigorous forms of photosynthesis. Lifeforms could evolve to cope with chlorine by developing molecules that neutralizes it like Earth-type organisms which rely on antioxidants, including Humans. 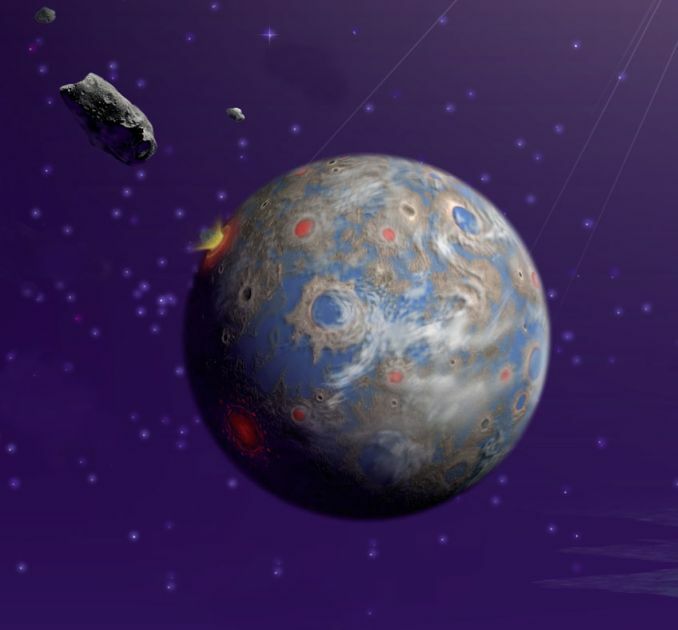 Ocean-bearing planets of stars with metallicities equivalent to, or greater than, the Sun could favor the evolution of chlorinic biospheres because of the higher relative seawater abundances of chlorine, bromine, and iodine their planets would tend to host. Chlorinic biospheres could be more common on spectral class G0�G2, F, and A stars that have "bulk metallicities of +0.0 Dex or greater" (David Shiga, New Scientist, December 8, 2010; and Johnson R. Haas, 2010). Silicon life - More radically, alien lifeforms could be based on silicon instead of carbon because atoms of both elements contain four electrons in their outermost orbital, and so silicon atoms can also be arranged in rings and long chains for the backbones of biological molecules. However, silicon is less abundant in the universe and its structures are much less stable and much more reactive than carbon's, particularly in the presence of oxygen where it produces a solid (more discussion from the NASA Astrobiology Institute and astronomer David Darling).